DIY body and face scrubs are becoming all the rage now due to the rise in popularity of natural skincare. When it comes to body and face scrubs, most rely on ingredients that can mechanically exfoliate the skin such as salt. But salt provides a range of skin benefits other than exfoliation, such as improving skin hydration and reducing acne. The most popular type of salt used in scrubs is Himalayan salt known for its pink color. The color of this healing salt makes DIY scrubs also look beautiful. 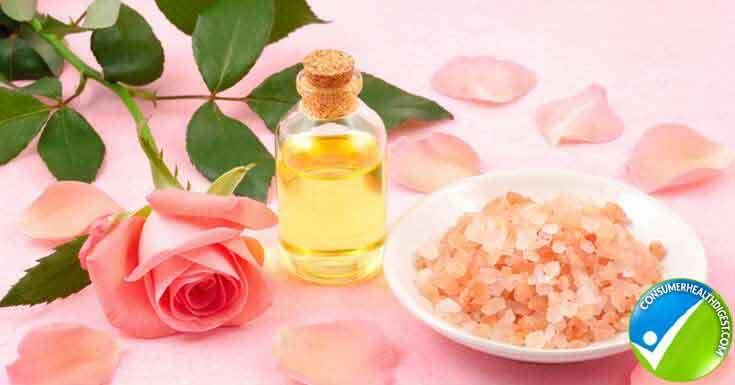 To understand more about the benefits of making your own Himalayan salt scrub and how you can make your own, keep reading. Salt is a mineral composite consisting largely of sodium chloride. We need salt in our diet to keep a healthy electrolyte balance. But too much sodium is also known to be bad for your health, causing hypertension and damaging the kidneys. When it comes to skin health, salt baths have proven to be helpful in a large number of studies. For instance, a study published in Skin Research and Technology concluded that salt baths helped improve atopic dermatitis and similar skin conditions. A different study published in the International Journal of Dermatology found that bathing in magnesium-rich salt improves skin barrier function, skin hydration, and reduces inflammation in the skin. You’ve probably already witnessed the benefits of salty water for the skin if you ever swam in the sea. So why not have these benefits of salt readily available through salt scrubs? When it comes to the benefits of Himalayan salt, the research is, unfortunately, lacking. But this has not deterred a lot of people from investing in Himalayan salt to include into their diet and beauty routines. In fact, you’ll find plenty of claims online that Himalayan salt was superior to other types of salt in ridding their skin of acne, blackheads, and dryness. These benefits most likely come from the natural antibacterial properties of the sodium content of Himalayan salt but also from the polyhalite found in this salt. Polyhalite is a mineral composite comprising of calcium, potassium, magnesium, and sulfur but also of oxygen and hydrogen. Himalayan salt also contains some fluoride and iodine which is beneficial for overall health. How to Make a Salt Scrub? Making your own salt scrub is easy. All you have to do is mix some of the salt with different oil and herbs if you like. The mixture of different oils with the salt will make the mixture compact and easy to use, but it will also give the scrub a nice fragrance. What type of oil you should add depends on your personal preference, skin type, and the problem you are trying to address. However, coconut oil is the main carrier oil here because it tends to solidify at room temperature. This oil is also perfect for the skin because it moisturizes and lathers at the same time. The DIY Himalayan salt scrubs will keep your skin looking flawless thanks to the power of the chemical composition of both Himalayan salt and the added healing oils. Additionally, you’ll get an at-home spa treatment through aromatherapy if you add aromatic oils such as lavender and rosemary as well as flower petals. Mix all the ingredients together in a jar until you get a unified consistency. If your coconut oil is solid, heat it up at a low setting in your microwave to make mixing easier. Optionally, add the rose petals or herbs on top of the mixture for baths or to create a luxurious feel to your scrub. Use a teaspoon of the mixture when doing a whole-body scrub and less if you are doing a facial scrub. The scrub works best if you leave it on your skin for a couple of minutes or up to 20 minutes when using it in a bath. Salt may be the most underrated skincare ingredient out there, which is strange considering almost everyone is familiar with the amazing effects bathing in seawater has on the skin. To use the healing properties of salt in your daily life, making a DIY salt scrub may be more convenient than going to the sea. Himalayan sea salt is a very popular choice in making body and facial scrubs due to its unique mineral content. The magnesium in Himalayan salt may be especially beneficial in improving your skin barrier functioning and keeping the skin well-moisturized.